The Sandhill Crane is one of the most interesting birds of North America. Their large size and their preference for open fields and marshes make them easy to observe. Join the Pat and Barb Ward to look for these majestic birds in northwest Indiana. Starting the day at 8:00 a.m. at the Comfort Inn parking lot in Bourbonnais, Illinois we’ll spend some time birding the Kankakee Sands area before heading to the Indiana Jasper-Pulaski Fish & Wildlife Area. 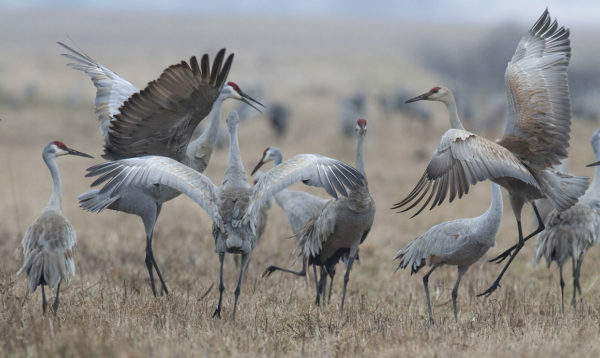 Thousands of cranes stop off there during their fall migration. We should be able to enjoy their haunting calls and, maybe, a crane dance or two. We will return to the Comfort Inn in Bourbonnais by 5:00 p.m.
Trip costs include transportation, lunch, snacks and water. Date: October 26, 2019 Time: 8:00 a.m. to 5:00 p.m.